This list provides an overview of thematic indices, works lists, and related topics. Also be sure to see the Biographies section for texts with detailed information in specific composers. Thematic Catalogs in Music: An Annotated Bibliography. Barry S. Brook. Pendragon Press. 1997. ISBN 091872886X (hardcover). In 1997, twenty-five years after its first publication this completely revised and expanded Second Edition contains almost twice as many entries as its predecessor; virtually every one of the original entries has been updated. The original numbering of the 1972 entries has been retained, with new items appearing in proper alphabetical/chronological sequence but with the addition of decimal numbers and/or letters. The original historical introduction and special appendices of the first edition have been retained with emendations where needed. The Da Capo Catalog of Classical Music Compositions. Jerzy Chwialkowski. Da Capo Press. 1996. ISBN 030679666X (hardcover), 0306807017 (paperback). The Da Capo Catalog Of Classical Music Compositions exhaustively lists the works of 132 major composers, from Vivaldi and Bach to Webern and Cage. A classical music lover's dream reference book, it is the only source containing all the essential information about classical compositions within the convenient covers of a single volume. Designed to be "user friendly" for listeners, readers, collectors, and connoisseurs alike, the catalog will show at a glance which works would complete a collection of Mozart's serenades or Dvořák's string quartets. The Da Capo Catalog Of Classical Music Compositions relies on authoritative sources (many of which are available only in the language of the composer), is easy to use and hard to put down, and will prove to be a vital component of any personal, academic or community library classical music reference shelf. Anton Cajetan Adlgasser: A Thematic Catalogue of His Works. Christine D. De Catanzaro, Werner Rainer. Pendragon Press. 2001. ISBN 0945193785 (hardcover). Anton Cajetan Adigasser (1729-1777) contributed to all the major genres of Salzburg music of the mid-eighteenth century: his output includes masses, requiems, litanies, vespers services,offertories, Marian antiphons, hymns, and German sacred songs, as we ll as numerous compositions for the Salzburg stage and several instrumental works. Adlgasser's activity as a composer marks him as one of the most important Salzburg predecessors of Wolfgang Amadeus Mozart and Johann Michael Haydn. This publication will contain detailed information on the sources for every known work by this composer. An introductory essay will include abiographical study and a discussion of the issues of authenticity and chronology. This catalogue will contribute to a clearer understanding of the sources of this music. It will be an indispensable reference tool for all students of Mozart, Salzburg, and the eighteenth century. Until the nineteenth century, the composer Carl Philipp Emanuel Bach (1714-1788) was better known than any other member of his famous family, including his father, Johann Sebastian. This is the first detailed catalogue of the complete works of C.P.E. Bach. E. Eugene Helm lists all of C.P.E. Bach's known works chronologically within categories, with quotations from the opening measures of all movements, and with information about manuscripts, early prints, authenticity, and relations among works. The catalogue is organized according to a basic plan. Part I includes instrumental music for the following categories: keyboard instrument alone; concertos and sonatinas; chamber music with a leading keyboard part; solo sonatas for wind or string instruments; trio sonatas; other chamber music; and symphonies. Part II contains vocal music for solo voice, for major choral works, and for choral works for special occasions. Part III consists of theoretical works. Additional sections include an account of past and present collections and lists of C.P.E. Bach's music; indexes of performing media, genres, and names of persons in special references, guides to early prints; a list of works not mentioned in Wotquenne's thematic catalogue; a concordance of Helm and Wotqueene numbers; a concordance of Helm numbers with those in Kast's Die Bach-Handschriften der Berliner Staatsbibliothek; an updating of the work-list in the New Grove article on C.P.E. Bach; and an extensive bibliography systematically coordinated with the main body of the catalogue. 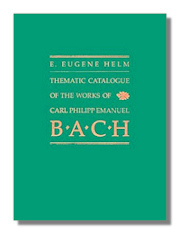 The catalogue, based on the holdings of nearly 200 libraries in fifteen countries, is the basis of the Carl Philipp Emanuel Bach Edition, which was established at the University of Maryland in 1983. New Hess Catalog of Beethoven's Works. James F. Green. Vance Brook Publishing. 2003. ISBN 0964057034 (hardcover). 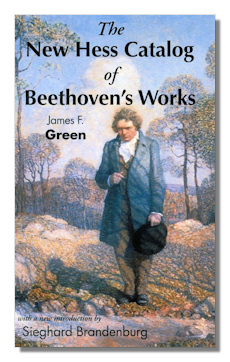 This book, The New Hess Catalog of Beethoven's Works is far more than a mere translation of Willy Hess's groundbreaking 1957 catalog of Beethoven's works, Verzeichnis der nicht in der Gesamtausgabe veröffentlichte Werke Ludwig van Beethovens. This new, revised edition includes four new appendices, an expanded concordance and a first edition of a hitherto unpublished piano transcription of the beginning of Beethoven's Seventh Symphony by Beethoven himself! It is a systematic overhaul of all 401 entries in the previous German edition. In addition to much new information on each entry, it clarifies misunderstood entries, and corrects mistakes. This new edition adds some much needed complete bibliographic references and incorporates forty-five years of Beethoven research into a single useful volume. Since 1851 there have been nearly a dozen catalogs of Beethoven's works printed; however, this is the first ever to appear in English. The Hess catalog is a fascinating book and a considerable amount of work went into updating the catalog to the current state of Beethoven research. Franz Benda: A Thematic Catalogue of His Works. Douglas A. Lee. Pendragon Press. 1984. ISBN 0918728428 (hardcover). Franz Benda (1709-1786) was one of the leading figures in the musical entourage assembled by Frederick II of Prussia in the mid-eighteenth century. His renown and influence on musical style of the early Classic era have been documented through many contemporary accounts of his skill as a performer, through the number and wide dispersion of his works, and by the collective influence of his many students during the later eighteenth century. Surveying Benda's complete catalogue, his symphonies, concertos, and sonatas were the works by which he was best known, and among these the solo-bass sonatas alone comprise a significant corpus of chamber music. Among his lesser-known works – trio sonatas, duets, and caprices – the caprices for solo violin formed the basis for violin studies well into the nineteenth century. 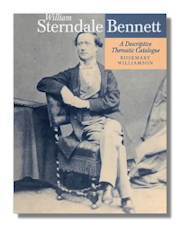 William Sterndale Bennett: A Descriptive Thematic Catalogue. Rosemary Williamson. Oxford University Press. 1996. ISBN 0198164386 (hardcover). William Sterndale Bennett (1816-75) was the leading English composer of the mid-nineteenth century. His music was highly regarded by Mendelssohn and Schumann, and was at one time widely played in Germany. The book presents a record of Bennett's total achievement for the first time and is aimed at both the general reader and the scholar. Each entry in the catalogue begins with a summary of the work's history, followed by detailed descriptions of all the authentic manuscript and printed sources with their locations, a list of important performances, references to the work in the composer's mostly unpublished diaries and correspondence, and a bibliography. An introduction sets the sources in their historical context, and there are appendices on Bennett's notebooks, the paper used in the autographs, the plate numbers in the printed music, and chronological and generic lists of all the works. Thematic Bibliographical and Critical Catalogue of the Works of Luigi Boccherini. Yves Gerard. Oxford University Press. 1969. ISBN 0197116167 (hardcover). Johannes Brahms: thematisch-bibliographisches Werkverzeichnis (Thematic-Bibliographic Catalog of the Works). Margit L. McCorkle. G Henle. 1984. ISBN 3873280418 (hardcover). Frank Bridge: A Thematic Catalogue. Paul Hindmarsh. Faber & Faber. 1984. ISBN 0571100325 (hardcover). 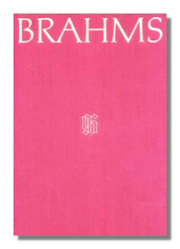 Johann Baptist Cramer: A Thematic Catalogue of His Works. Thomas B. Milligan, Gerald C. Graue. Pendragon Press. 1994. ISBN 0945193416 (hardcover). A student of Clementi and C.F. Abel, Johann Baptist Cramer (1771-1858) was a prominent concert pianist (particularly admired for his artful improvisations), and pedagogue. His multi-faceted musical career included the composition of 124 skillfully crafted sonatas, nine piano concertos, and numerous pieces for the amateur musician, as well as the establishment of a music publishing business. Cramer's oeuvre is divided into twelve groups (arranged chronologically within each group); each citation includes an incipit, a diplomatic rendering of the title-page of the first edition and/or autograph manuscript, and a date of the source (with an indication of the means by which that date was established). 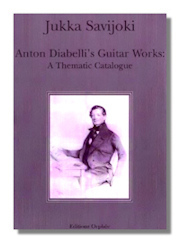 Anton Diabelli's Guitar Works: A Thematic Catalogue. Jukka Savijoki. Editions Orphée. 2003. ISBN 1882612450 (paperback). Giovanni Gabrieli: A Thematic Catalogue of His Music with a Guide to the Source Materials and Translations of His Vocal Texts. Richard Charteris. Pendragon Press. 1996. ISBN 0945193661 (hardcover), 0945193661 (paperback). Giovanni Gabrieli (c.1555-1612) is the greatest Venetian composer of the late Renaissance, and one of the most significant figures of the period. Since the time when Richard Charteris was invited by the American Institute of Musicology to edit Giovanni Gabrieli's complete works in twelve volumes for the series Corpus mensurabitis music, he has uncovered a considerable number of previously unknown works by this composer, and discovered a vast quantity of hitherto unknown sources of h is music. This thematic catalogue presents data about these discoveries and many others, besides collating an enormous amount of widely-scattered information. Also included is a thematic indicator of each work and an English translation of each of Gabrieli's vocal texts. Francesco Geminiani: Part 1: Life and Works; Part 2: Thematic Catalogue. Enrico Careri. Oxford University Press. 1993. ISBN 0198163002 (hardcover). Although Francesco Geminiani (1687-1762) is a relatively well-known composer whose name is frequently cited in studies of baroque music, his biography and works have been relatively little researched. His music was often analyzed without due reference to biographical and historical background, and his multifarious activities as violinist, composer, theorist, and small-scale entrepreneur were never considered in their full interrelationship. This volume represents a first attempt at providing a comprehensive account of a composer who in the first half of the eighteenth century dominated the English musical scene alongside Handel. The book traces Geminiani's life and career from his birth in Lucca in December 1687 to his activities in three centers: London, Paris, and Dublin. After analyzing the critical reception to Geminiani, both contemporary and modern, Careri examines his compositions by genre, illustrating his remarks with thirty-nine music examples, some presented in facsimile. The book also includes a complete thematic catalogue with music incipits, containing details of primary sources, reworkings and transcriptions, and modern editions. Valentin Haussmann: A Thematic-Documentary Catalogue of His Works. Robert B. Lynn, Klaus-Peter Koch. Pendragon Press. 1997. ISBN 0945193912 (hardcover). Valentin Haussmann (1565/70-ca. 1614) was a highly regarded composer in his time whose works had great popular appeal and were frequently reprinted, anthologized, and copied in lute or keyboard arrangements. His extensive travels and pioneering spirit led him to search out interesting repertories, such as Italian villanellas, canzonettas, and balletti which he published with his own German texts, as well as Polish dances which he heard in East Prussia. The main body of this catalogue is organized by musical sour ces, as in RISM series A (printed sacred, secular and instrumental, and occasional works), expanded to include manuscript sources, lost works, works in seventeenth-century collections, works edited by Haussmann with his own German texts,modern manuscript copies, and works by other composers using Haussmann's melodies or texts. Many sources, listed as lost in recent bibliographies, have been located and are included here. Title pages, dedications, laudatory poems, and letters are transcribed in full, and Cantus incipits are provided in musical notation. Additional sections include an Index of First Lines, two indexes of Cantus incipits (one indicating pitches and rhythms, the other interval progression), a listing of works in modern editions, and an extensive bibliography. This catalogue will be a basic research tool for anyone investigating the history of German music at the beginning of the seventeenth century. Johann Michael Haydn: A Chronological Thematic Catalogue of His Works. Charles H. Sherman. Pendragon Press. 1993. ISBN 0918728568 (hardcover). Johann Michael Haydn (1737-1806) was one of the foremost composers of the German school in the late eighteenth century. As a creative artist, he may well stand second only to his brother, Joseph, and to his Salzburg neighbor, Wolfgang Amadeus Mozart. To be sure, his contemporaries generally regarded Michael's sacred vocal music as superior to that of his two great colleagues; and connoisseurs continued to praise his Masses and other pieces for the church well into the nineteenth century, citing the strength of their conception and the nobility of their expression. This catalogue contains all known works and presents for each an inventory of principal manuscript sources-autographs, authentic, and secondary copies. Compositions are further indexed by genre and cross-referenced to the old catalogues of Klafsky and Perger in the Austrian Denkmäler. 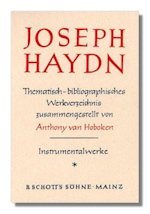 Joseph Haydn Thematic Catalog. Anthony von Hoboken. Schott. 1980/1981. 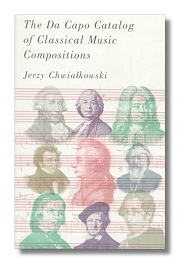 Volume 1: Instrumental Works - ISBN 3795700019 (hardcover). Volume 2: Vocal Works - ISBN 3795700027 (hardcover). Volume 3: Register - ISBN 3795700035 (hardcover). The seminal thematic catalog of Haydn's output. The Music of Gustav Holst and Holst's Music Reconsidered. Third Edition. Imogen Holst. Oxford University Press. 1986. ISBN 0193154587 (hardcover). A leading figure of English music in the late nineteenth and early twentieth centuries, Gustav Holst is best known for his orchestral tour de force, The Planets. He composed music of startling originality in many forms, drawing inspiration from sources as varied as English folk-song, oriental melody, the Apocrypha, and Sanskrit literatures, as well as from such writers as Keats, Hardy, and Whitman. In this study of her father's music, Imogen Holst discusses Holst's pieces of the early 1890s, the musical consequences of his holiday in Algeria in 1908, problems of performance in The Planets, and editing Holt's music. The volume also includes a list of important dates in Holst's life, a list of his published work, and a bibliography. Joseph Martin Kraus: A Systematic-Thematic Catalogue of His Musical Works and Source Study. Bertil H. Van Boer. Pendragon Press. 1998. ISBN 0945193696 (hardcover). Often called the Swedish Mozart, Joseph Martin Kraus (1756-1792) can be considered the principle figure at the court of Gustav III of Sweden, whose idiosyncratic love for the theatre led to the creation of a unique cultural milieu. Kraus, born in Germany and trained by members of the Mannheim orchestra, was a member of the Sturm und Drang Hainbund and later achieved a considerable reputation for his music, conducting, and pedagogocal interests. This work contains an expanded thematic catalogue outlining the music of this composer, arranged systematically according to genre. Part I contains a series of essays giving a source-critical study, including issues of authenticity and chronology.Part II is devoted to the catalogue itself. 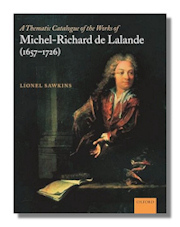 A Thematic Catalogue of the Works of Michel-Richard de Lalande. Lionel Sawkins. Oxford University Press. 2006. ISBN 0198163606 (hardcover). As chief court musician to Louis XIV and Louis XV, Michel-Richard de Lalande (1657-1726) is chiefly remembered for his sumptuous orchestral motets and much attractive instrumental music. In this thematic catalogue of his music, Lionel Sawkins illustrates the composer's music with over 3,000 music examples, details of performing requirements and of all source materials, as well as with comprehensive indexes and thematic locators. Thematic Catalog of the Works of Marin Marais. Garrett H. Bowles. Rowman & Littlefield. 2007. ISBN 0914913441 (hardcover). The Works of Benedetto and Alessandro Marcello: A Thematic Catalogue With Commentary on the Composers, Repertory, and Sources. Eleanor Selfridge-Field. Oxford University Press. 1990. ISBN 0193161265 (hardcover). The Venetian composer Benedetto Marcello (1686-1739) was preeminently important in reshaping musical thought and practice to suit values revived from classical antiquity. His music was widely known and respected throughout the eighteenth and nineteenth centuries. This is the first systematic inventory of the 700 musical works attributed to him. The catalog also lists the works of the composer's brother Alessandro (1668-1747) and other information about the literary and musical achievements of the Marcello family. Including an extended commentary on the composers and their music, as well as numerous appendices and indices, this reference provides information of interest to performers, editors, and students pursuing style-critical and source-critical studies. Thematic Catalogue of the Works of Jacques Offenbach (Two Volume Set). Antonio de Almeida. Oxford University Press. 2001. ISBN 0193152673 (hardcover). Jacques Offenbach was born in Cologne in 1819. He left Germany at a very early age and lived in Paris where he died in 1880. His debuts in the French capital were as a virtuoso cellist (student at the Paris Conservatory, member of the orchestra of the Opera Comique, and a very fashionable society musician). From the musical directorship of the Comedie Francaise, he graduated to composing for the stage, creating the true French Operetta, managing Parisian theatres, and gradually producing a string of masterpieces which have won him universal popular appeal and withstood every test of time and fashion. He composed a staggering total of 113 stage works (some incomplete), and approximately 256 vocal and 253 instrumental works. The stage works include three operas (of which the third, The Tales of Hoffman, is justly considered a masterpiece) and such unsurpassed operettas as Orpheus in the Underworld, La Belle Helene, La Perichole, The Grand Duchess of Gerolstein, and La Vie Parisienne. This complete thematic catalogue of Offenbach's works took Antonio de Almeida some 25 years to compile. He had where possible gone back to original manuscripts, and has provided as detailed and comprehensive a guide to Offenbach as is possible at the present time. 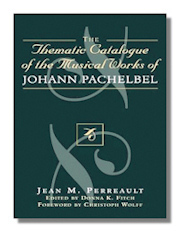 Thematic Catalogue of the Musical Works of Johann Pachelbel. Jean M. Perreault. Scarecrow Press. 2004. ISBN 0810849704 (hardcover). This Catalogue provides scholars and performers with a survey of the breadth and variety of the repertoire of the composer about whom Christoph Wolff describes as one of the most seminal and influential musicians of the pre-Bach generation in Germany. Pachelbel composed the majority of his 527 works for keyboard instruments, as well as choral, vocal and chamber music and the Catalogue presents incipits for each that can be identified. The list of works is intended to determine the totality of the corpus and knowledge about it, to determine the best means of identifying each work, and to settle problems of identity among similarly titled works. An essay on authorities examines the controversies of authenticity of Pachelbel manuscripts. Volume 1 - The Dramatic Works. Michael F. Robinson. Pendragon Press. 1991. ISBN 0918728754 (hardcover). Volume 2 - The Non-Dramatic Works. Michael F. Robinson & Ulrike Hofmann. Pendragon Press. 1994. ISBN 0945193602 (hardcover). This two-volume thematic catalogue of Paisiello's oeuvre covers all nine categories of composition, and is the result of 12 years of archival research. Details of differing versions, rewritten and rearranged pieces, and other confusing variant s help clarify questions of authenticity and augment existing information about this important 18th-century composer. Volume II completes the inventory of his oeuvre initiated with Vol. I, Dramatic Works. The contents include: Miscellaneous secular vocal works; Passions, Oratorios and sacred Cantatas; Religious music for the Bonaparte family; other music for the Mass; other liturgical music; Non-liturgical church music; Instrumental music; Pedagogical works. The Appendices include: Works of uncertain attribution; Works falsely attributed to Paisiello; List of surviving letters in Paisiello's hand; Bibliographical sources; Discography; Index of titles and first lines in Volumes I and II; Index of personal names in Volumes I and II; Addenda and corrigenda to Volume I.
Giovanni Battista Pergolesi: A Thematic Catalogue of the Opera Omnia. Marvin E. Paymer. Pendragon Press. 1977. ISBN 0918728010 (hardcover). A thematic catalogue of the Opera Omnia, including an appendix of attributed works omitted from the Opera Omnia. The works attributed to Giovanni Battista Pergolesi (1710-1736) have long represented a Spuriosity Shoppe of enormous dimensions. The compiler of this catalogue, Marvin Paymer, is a world authority on Pergolesi. His Ph.D.dissertation at the City University of New York is entitled The Instrumental music attributed to Giovanni Battista Pergolesi: A study in authenticity, and he is joint author of the Pergolesi entry in the forthcoming Sixth Edition of Grove's Dictionary. He brings order out of chaos in the Pergolesi complete works edition with this thematic catalogue, adding a thematic locator and an important appendix of attributed works omitted from the Opera Omnia. The volume is profusely illustrated. 124 pages. Illustrated. Index. Appendix. Bibliography. 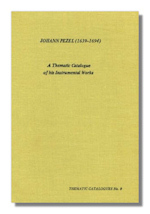 Johann Pezel: Thematic Catalogue of His Instrumental Works. Elwyn A. Weinandt. Pendragon Press. 1983. ISBN 0918728231 (hardcover). Though best known for his wind music, Johann Pezel actually wrote more than twice as many instrumental works for strings. His entire instrumental oeuvre is examined and evaluated in this catalogue, which includes an extended introductory essay , over 500 incipits, and fifteen plates of original title pages and parts. Ignace Pleyel: A Thematic Catalogue of His Compositions. Rita Benton. Pendragon Press. 1977. ISBN 0918728045 (hardcover). A Catalogue of the Compositions of S. Rachmaninoff. Robert Threlfall, with Geoffrey Norris. Scolar Press. 1982. ISBN 085967617X (hardcover). The Music of Antonio Rosetti (Anton Rosler): A Thematic Catalog. Sterling E. Murray. Harmonie Park Press. 1997. ISBN 0899901050 (hardcover). Rosetti (ca. 1750-1792) was a versatile and prolific composer, who in his short lifetime authored over two hundred compositions embracing most of the instrumental and vocal genres popular in his day. The majority of his music is instrumental, with symphonies, concertos, and wind partitas forming a substantial group. His vocal works include primarily lieder and settings of religious texts, including oratorios, masses, and other liturgical choral music. Anton Rubinstein: An Annotated Catalog of Piano Works and Biography. Larry Sitsky. Greenwood Press. 1998. ISBN 0313254974 (hardcover). Anton Rubinstein, a seminal figure in Russian music, was not only a great pianist but also a monumental influence in Russian music education. Rubinstein is responsible for laying the groundwork for Russia's tertiary educational system for the training of musicians and for establishing the use of Western structural forms in Russian music. He later became the foundation director of the St. Petersburg Conservatory. Detailing Rubinstein's pianistic and conducting repertoire, this work provides insight into Russian nineteenth-century performance practice, and the biography presents a sober assessment of Rubinstein's place in history. The author has researched valuable Russian sources to make this assessment of Rubinstein available in English and has provided informative guidelines for further research. Archduke Rudolph, Beethoven's Patron, Pupil, and Friend: His Life and Music. Susan Kagan. Pendragon Press. 1989. ISBN 0918728746 (hardcover). In early 19th-century Austria the Archduke Rudolph occupied multiple roles: a noble Hapsburg by birth, a Cardinal-Archbishop by career, and a dedicated musician by avocation. A talented pianist and composer, Archduke Rudolph enjoyed the unique privilege of being Beethoven's only composition student, and in the two decades of studying with him produced a sizable and well-crafted body of music for piano, chamber ensemble, and voice. Many of the Archduke's autograph manuscripts were corrected in detail by Beethoven, giving us fascinating insights into Beethoven's thinking on the structure and syntax of music. This comprehensive book surveys Archduke Rudolph's life and career in music, which also encompasses his significant role as music patron and collector. It is based on a study of primary sources, principally the autograph manuscripts of his compositions and sketches, and most importantly, Beethoven's own autographs-including sketches, corrections on the Rudolph manuscripts, and a four-measure theme composed expressly for Rudolph's use-produced here, in facsimile, for the first time. Other primary sources examined include the Archduke's correspondence with Beethoven and members of the Imperial household, the catalogues of Rudolph's music collection, and documents related to his ecclesiastical career. The thematic catalogue of Archduke Rudolph's music lists all of his finished and unfinished works in chronological order, as well as sketches, copies, and transcriptions. Fifty illustrations and 190 musical examples are also provided. Volume I: The Instrumental Works. Sabina Teller Ratner. Oxford University Press. 2002. ISBN 0198163207 (hardcover). 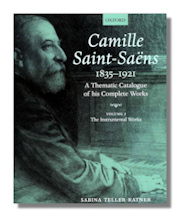 Camille Saint-Saëns (1835-1921) was a great French composer. All his musical works are presented: the well-recognized masterpieces, the childhood sketches, the unpublished compositions, and the previously unknown pieces now revealed for the first time. This comprehensive collection fully documents the composer's extraordinary contribution to the musical world. Volume 1 concentrates specifically on his Instrumental output, while the two later volumes will cover Dramatic Works and Choral & Vocal Works respectively. 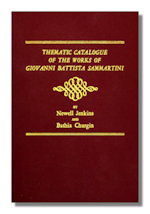 Thematic Catalogue of the Works of Giovanni Battista Sammartini. Newell Jenkins, Bathia Churgin. Harvard University Press. 1976. ISBN 0674877357 (hardcover). Franz Schneider: A Thematic Catalogue of His Work. Robert N. Freeman. Pendragon Press. 1986. ISBN 0918728134 (hardcover). As composer, organist, and teacher for nearly half a century, Franz Schneider was a central figure in the 18th-century school of composers active at the Benedictine Abbey of Melkon the Danube, Austria, which counted among its members Haydn's pupil Robert Kimmerling, Constanze Mozart's musical advisor Maximilian Stadler, and Beethoven's teacher, Johan Georg Albrechtsberger. Schneider, a student of Albrechtsberger, played an important role in the history of religious music in the Classical period. This book lists 296 original compositions, versions and connafacta – eighteen involving the Haydn brothers alone – based mainly on a unique collection of holographic scores, fragments, and sketches preserved at Melk. Since many of the problems of attribution could be solved, the catalogue provides a valuable reference not only to Schneider's own compositions, but also to those of a number of his contemporaries. An illustrated list of watermarks in the music papers used at Melk in the second half of the eighteenth century is included. 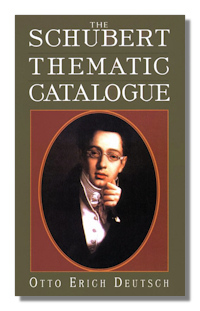 The Schubert Thematic Catalogue. Otto Erich Deutsch. Dover Publications. 1995. ISBN 0486286851 (paperback). A specialist in Schubertian biography and bibliography definitively catalogs the 1,515 known and traceable Schubert works in their chronological order. Schubert dated virtually all of his manuscripts, and the listings are in chronological order. The musical themes are printed with information on when they were written, where the original manuscript is today, and, where applicable, how a work differs from earlier versions. Entries include title, catalog number, date and place of composition, location of original manuscript, statistics of first performance and first edition, historical notes and more. 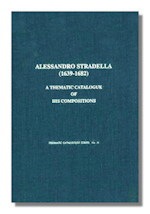 Alessandro Stradella: A Thematic Catalogue of His Compositions. Carolyn Gianturco, Eleanor McCrickard. Pendragon Press. 1991. ISBN 094519305X (hardcover). Alessandro Stradella (1639-1682) was one of the most important composers of seventeenth-century Italy, contributing significant works to almost every contemporary genre. However, his precise position within the Italian musical baroque has never been properly evaluated, while his biography has long been enshrouded in myth and legend, following his murder in Genoa. This book is the definitive life and works study of this crucially important composer. The biographical section is the result of extensive documentary research over many years, and presents a clear account of Stradella's career and colorful personal life in all the cities where he lived – Rome, Venice, Turin, and Genoa – as well as information on his patrons and the poets whose words he set. The musical discussion offers a clear expositon of Stradella's 308 extant compositions, illustrated with nearly fifty music examples. The Tchaikovsky Handbook: Volume 1: Thematic Catalogue of Works. Alexander Poznansky & Brett Langston. Indiana University Press. 2002. ISBN 0253339219 (hardcover). Here is a scholarly resource of inestimable worth. 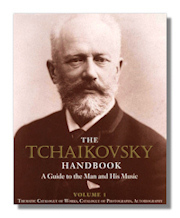 It is a comprehensive guide to all known Tchaikovsky resource materials – every composition, finished or unfinished; all the writings, every piece of correspondence, all the diaries, every interview; all the photographs (with thumbnail images); and everything written about Tchaikovsky. This is a tremendous bibliographical undertaking and will raise the bar for Tchaikovsky scholarship overnight. Volume 1 contains: Thematic Catalogue of Works, Catalogue of Photographs, Autobiography. Virgil Thomson's Musical Portraits. Anthony C. Tommasini. Pendragon Press. 1986. ISBN 0918728517 (hardcover), 0918728517 (paperback). From 1928 until the present, Virgil Thomson, Dean of American composers, distinguished critic and author, has composed musical portraits of people. Though he was not the first composer to do so, the seriousness of his working methods and the quantity of his output (140 in all) make Thomson's practice of musical portraiture unique. 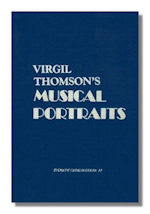 Tommasini's book is based on his extensive interviews with Virgil Thomson, his examination of Thomson's manuscripts and documents, and his correspondences with over sixty subjects of Thomson portraits (the still-available sitters, as Thomson has called them). Earlier examples of musical portraits are examined, as well as the literary portraits of Gertrude Stein, works which inspired Thomson to experiment with portraiture in music. Thomson's working procedure is discussed in detail, the Thomson portraits are surveyed stylistically, and four selected portraits are analyzed theoretically. William Walton: A Catalogue. Stewart R. Craggs (Editor). Oxford University Press. 1990. ISBN 0193154749 (hardcover). This definitive catalog of the works of William Walton (1902-83) has been completely revised, updated, and extended since the first edition appeared in 1977. Designed to be a comprehensive source of musical and documentary information relevant to Walton's life and work, the book provides full details of dates of composition, people responsible for a work's commission, instrumentation, first performance, publication, the location of autograph manuscripts, critical comment, and significant recordings. William Walton: A Thematic Catalogue of His Musical Works. Stewart R. Craggs. Oxford University Press. 1977. ISBN 0193154331 (hardcover). Thematic catalogue proceeded by critical appreciation, introductory notes and acknowledgments. Compositions organized chronologically. Each entry includes selected information on the following: instrumentation, duration, length (in measures), name of the person to whom the work is dedicated, first performance, location of the manuscript, related bibliographical citations, recordings, revised editions, who commissioned the piece, the London premiere. Includes incipits. Catalogue followed by general bibliography, classified list and index of works, and general index.